If you are reading this you survived Monday! I'm still baffled how week after week it continues to catch people off guard but what do I know? 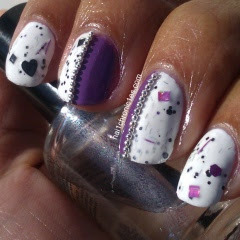 Anywho, as promised I have Polish Addicts Metal Princess to show you today! Check it out after the jump. If you aren't tired of milky white based glitter polishes (which I don't know how one could be) then you NEED Metal Princess. 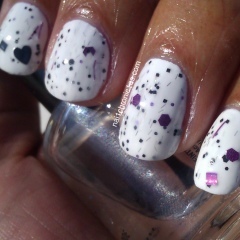 It's milky white base contains holo and purple bar glitter, larger purple hex and square glitter, smaller black hex glitter, large and small black square glitter, and black hearts in a milk.... SWOON!!!!! This is 1 coat of Metal Princess over Sinful Colors Snow Me White. No top coat. I did have to dig for larger glitters a bit but this is probably due to the fact I got a mini bottle. This polish is definitely worth the full size purchase, unless you are like me and just can't decided and want multiple polishes on a budget. 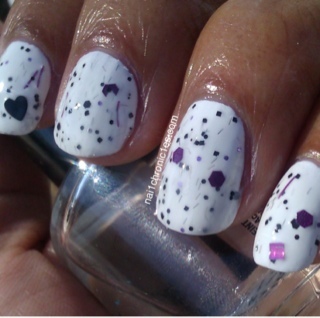 I then decided to break out China Glaze Spontaneous and some beads for a simple jazzy nail art.